I’ve packed our freezer full with boxes of Pepperidge Farm® Puff Pastry sheets, because I’m going to make a LOT of Classic Napoleon this holiday season. No self-respecting Armenian or Persian bakery would open its doors without slating this delicate pastry on offer. Who knows where it got its name? Perhaps the ferocious world conqueror had a fragile, sweet side that only Josephine knew. Never mind that. Let’s focus on getting this to your plate and fast. You need nothing more than Puff Pastry, instant vanilla pudding and some sort of milk. Good food comes from good ingredients. That doesn’t mean spending obscene amounts of money at the market. 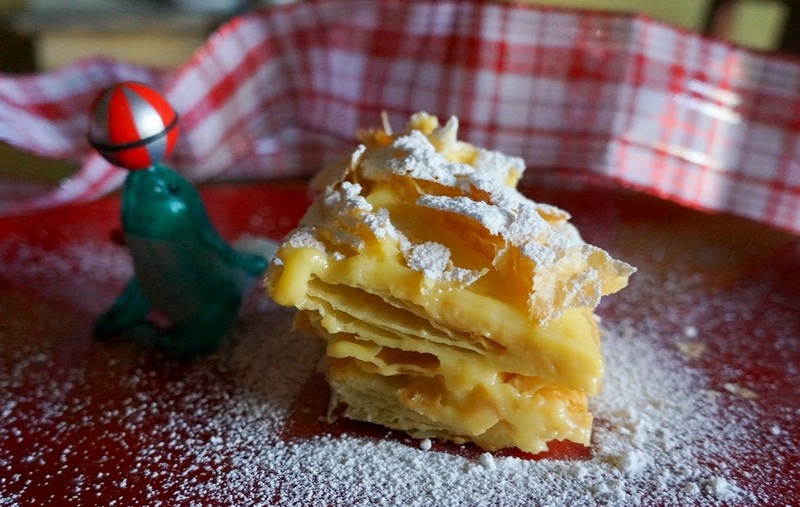 3 simple ingredients are all you need to make Classic Napoleon: Milk, instant pudding and puff pastry. Grab a box (or two) Pepperidge Farm® Puff Pastry from the freezer aisle where the pie crust and whipped toppings are found. Get your favorite instant vanilla pudding and some milk. Coconut, soy, almond milk are great substitutes for a lighter, vegan version. We are long-time fans of anything Pepperidge Farm. The cinnamon raisin swirl bread has been a breakfast staple for me for years. I never seem to tire of it. It’s even better toasted, filling the entire house with the warm smell of cinnamon. There’s always a box or two of their Puff Pastry on hand at our house, too. Throwing a successful party depends on two basic things: Good food and good company. Everything else is irrelevant. You don’t have to have a fat wallet to enjoy something posh this holiday season, because Classic Napoleon is for everyone. All you need is a box of Pepperidge Farm® Puff Pastry, a box of instant pudding and milk of some sort. Add your own personal touch to my recipe by spiking the pudding with almond extract or adding fresh berries to the mix. One taste of this stuff and your guests will be wondering where you’ve been hiding your Bugatti all these years.